It's like watching Game of Thrones in the Jungle. There are stupid Stark Wolves, a smart and strong Lannister Tiger (this is India, so the Lion had to be replaced) and a funny Mormont Bear, who has stolen the Stark words, "Winter is coming!" The animation is really impressive and you immediately accept, that the animals can talk. They look incredibly real on the screen. The movie is rarely too childish and at times it's even quite dark. The jungle is a tough place to live and survive. 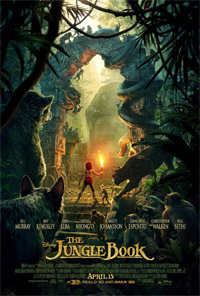 The only problem is the main character, Mowgli [Neel Sethi]. He suffers from the same problem as 99% of all other child actors, that he can't act. It is not terrible to witness, but in scenes where there is too much dialogue, it does get rather annoying. Other than that, it was a fun and cool ride. Speaking of annoying children, people shouldn't be allowed to bring their children to the cinema, until they have taught them to keep their tiny mouths shut for the duration of a movie. Annoying children should be fed to the hungry lions or tigers. "Hear me roar!"